We’re reasonable people. It’s his first year, we thought. There’s dozens of kids. He still doesn’t speak so clearly as he might. We figured: one end or other of the donkey, perhaps. (Likely the back end if he persists in delightedly locking all the school toilet doors from the inside and crawling out underneath…) It’s a non-speaking part, yes, but he can bray with the best of ’em. Or fart, whatever. Or a stable cat; he can climb like one. One of a cherubic flight of angels if someone has a daft sense of humour. Or maybe – just maybe – a shepherd; the kid knows his sheep, after all. We’ve been quietly eyeing up potential stripey tea-towellage in case parents were supposed to provide costume. I think the phrase I want is… goat rodeo. There are no, repeat no worries about getting Harry into character here, but with this King in charge of following yonder star, the production will head in unexpected directions. Possibly the emergency exits. Oh sniffle! You really had me going there–I’ve read a few too many tales of exclusion recently, I suppose, either intentional or due to unfairly low expectations, and I was bracing myself for something that would make me rageful and/or sad. Instead I got all choked up. Lovely! Yaaaaaay Harry! Hope I’m not going too far afield into controversial religious stuff, but I only wish we could have a nativity play around here, more as a cultural tradition than anything else. But religion is so highly charged that it’s just off the table, at least in this region. For a long time I identified as something VERY non-mainstream so I certainly get the other point of view, but. What fun to be a king! It’s a C of E primary, hence much nativitiness. Hope he gets to bring the gold or myrrh…frankensence might be a bit much for him yet. Otherwise, he will make a fine king! But, get video, just in case. Ohh, pleasepleaseplease video it pleasepleaseplease. I SO want to see King Harry’s Goat Rodeo. Pleasepleaseplease. He’ll either be so angelic and well-behaved you’ll die of pride, or the mayhem will be Stuff of Legend and the video will be shown to his prospective dates when he’s seventeen and you’ll (eventually) die of hilarity. Either way, GOLD. Even if they make him carry the myrrh. It’s the only one of the three he can say (still no g, c or k happening) so I reckon myrrh & Balthazar are virtual certainties! His true character has been discovered at last. I think it’s great that they’re getting him to play with them reather than against them. Break a leg! He is going to rock.Absolutely. I hope they give him the gold – Frankincense and myrrh are much harder to make off with. I’m pretty mystified about the face-painting. I mean, I DO paint a good tiger, but the big cats tend to sit uneasily alongside the traditional nativity stable prey-animal inhabitants! I had a horrible moment of wondering if they intended to turn all the kids into more ethnically authentic characters, but… surely not! Fabulous casting!! He’ll be brilliant. We’ve never had a nativity play for ours. And he won’t suffer the simmering resentments of never being an angel That some of us have 40 odd years down the line! Stick the kids who were ethnically closest to the people of Judea into visiting children “from afar” why don’t you. It still bloody rankles. 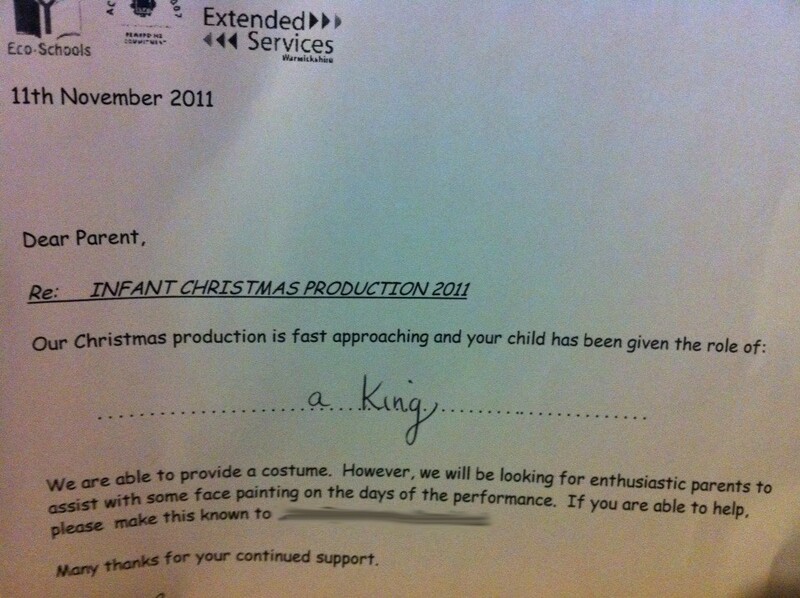 Let’s face it, that’s star billing in nativity play terms for a boy. The best costume, the properly defined purpose (Joseph is nowhere in that respect), the big entrance. Go, Harry! They don’t seem to do nativity plays here in the Netherlands, which is a shame. My son won’t be getting to repeat my truimphs on the stage, althought that’s unlikey in any case. Even progressive Dutch schools might think casting a boy as Mary was just a tad too avant-guard. Mary twice, me, and an angel the other times. What can I say; it was the 70s and I had the longest and blondest hair, so I was a shoo-in! From experience I can tell you to practice hard at your Kingly Role and all will be well. You will enjoy yourself exceedingly much and the applause, especially from those audience members related to you,will be uproarious and genuinely felt. I promise. Much love, and break a leg! Your Antipodean Tap Dancing Aunt. I like that fancy ‘g’. Do they learn calligraphy at his school? Not calligraphy, alas. Joined-up writing, no less! They teach them joined-up characters from the very beginning now. Harry has evidently got the gist, if not the technique, as I watched him go back and draw little line ‘bridges’ between the letters of a perfectly nicely formed H a r r y at the weekend. I agree with May, this is gonna be epic!! Please get video so we can see it! How fun! I also heard an extremely funny story about some kids in the church Christmas pageant that were scuffling and elbowing behind everyone, then suddenly started whacking each other with their shepherd’s staffs, much to the crowd’s general amusement! I can’t wait! If there isn’t any shoving I shall demand my money back! I have certainly understood your reluctance to share pictures of Harry, but could you at least show us the costume from the back, or with the face obscured? When is this to occur? Brilliant, congratulations Harry! I’m sure he’ll be a star, one way or the other. I must confess I haven’t been able to take nativities seriously since seeing the Flint Street Nativity when it was on TV years ago. It was pure genius and brought back worrying memories of my own performance as a “traveller going to Bethlehem”. Angel jealously still burning fiercely here too I’m afraid! Ah! This is happy-making news! He is going to have FUN. I can’t wait to hear all about it… maybe some video/photos too? Generally I do not learn post on blogs, but I wish to say that this write-up very compelled me to try and do so! Your writing style has been amazed me. Thanks, very nice article.